The enormous growth in mining activity across the African continent has seen an increasing demand for better infrastructure and improved cross-border business conditions. Yet, infrastructure remains poor and in some cases non-existent and business conditions opaque and complex, leaving the process of procuring and transporting between countries highly challenging. Innovative, flexible approaches to procurement and supply chain design and execution are therefore required, both of which need to be unique and responsive to their varying environments. What are the best strategies for alleviating constraints in cross-border supply chains? What works and what doesn’t work in Africa? What are the different types of supply chain and what works best for your business? Trade finance and cross-border payments: how to fund the movement of goods in and around Africa? In addition, there was a one-day pre-event workshop dedicated to helping you manage the legal and tax challenges when exporting goods in and around Africa. Please share your thoughts with us on our Twitter page @CrossBorderMine using the hashtag #CBMS18, and please also join our new LinkedIn group. Interactive and strategic discussions around the cross-border mining services industry and the challenges and opportunities for all parties involved in this sector. Heads of Supply Chain, Procurement, Logistics and others from mining houses, equipment suppliers, EPC companies, 3PL/4PL providers and freight forwarders from South Africa and beyond. The CBMS Indaba will provide regular news content through business, financial and trade media via interviews and interaction with our speakers, sponsors and delegates. Check out our "In the News" page. 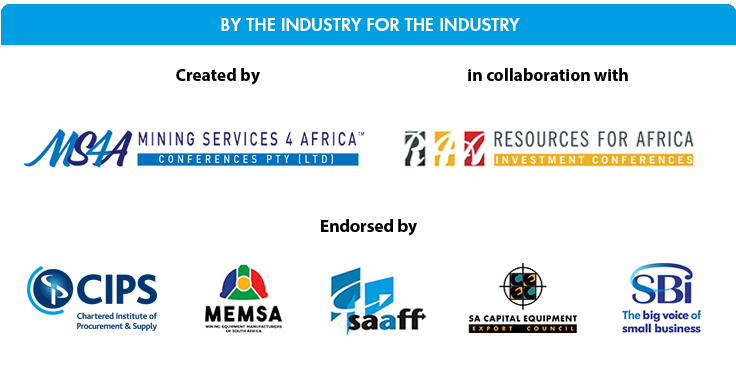 We invite global and local mining and procurement/supply chain brands to partner with the CBMS Indaba. Boost your company brand to this influential target audience through one of our packages.